Hey everyone! 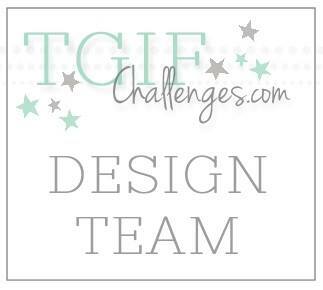 Can you believe that it is already time for another Artisan Design Team Blog Hop??? Well it is! You should have just arrived from the fabulous Inge. If not, be sure to click the "Next" button at the end of each post until you have visited everyone. I know I say this a lot, but I really love the project that I have to share with you today. When I seen the I'm Thankful For stamp in my box, it got me thinking about what I'm thankful for. I realized that I have a lot to be thankful for, but that I am most thankful for today and the people in my everyday. I thought it would be great to make a little mini album to remind me of this. I decided to use five of the pieces from the Simply Created Banner Refill Kit as my pages. 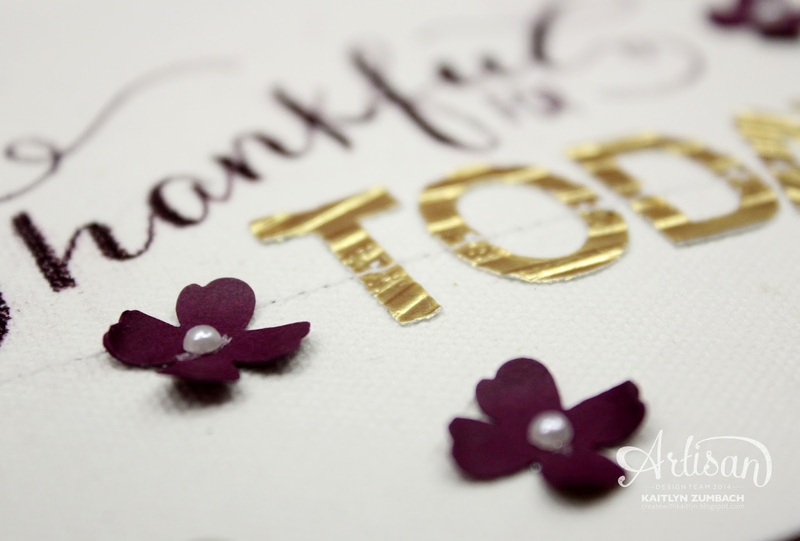 The color scheme of Very Vanilla, Blackberry Bliss, and Gold turned out to be really elegant. 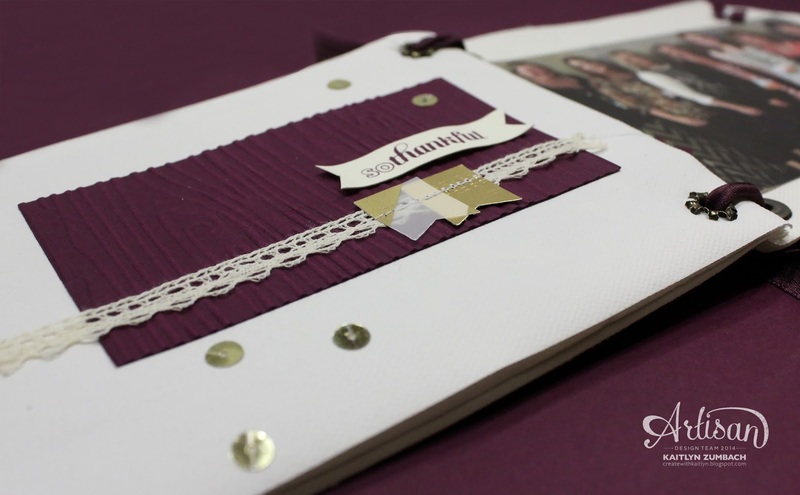 I wanted to keep a very organic feel to the entire album, so I added touches of the Wood Grain Embossing Folder and some flowers from the Itty Bitty Accents Punch Pack. 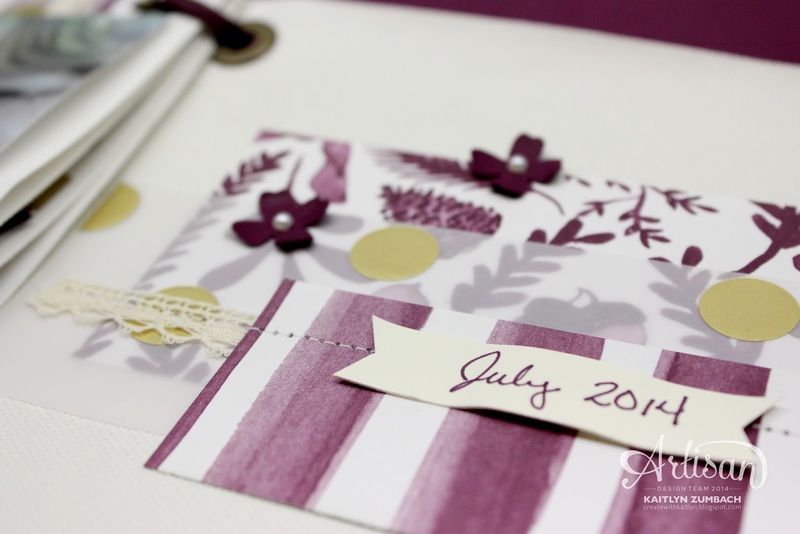 The Blackberry Bliss patterns from the Color Me Autumn Designer Series Paper also have a great organic feel, so it was a perfect fit! As you can see, I kept the pages fairly simple. I just layered different sized pieces of the Designer Series Paper, Blackberry Bliss Card Stock, Gold Fancy Foil Vellum, and Venetian Crochet Trim. Some Gold Sequins and Gold Buttons provided beautiful finishing touches. The only tip I have for you is that if you are going to sew like I did, be sure to plan both sides of the page first as the stitiches will be visible on both sides. I am in love with the feel of this album and the photos in it! What would you include in your "I'm thankful for" album? 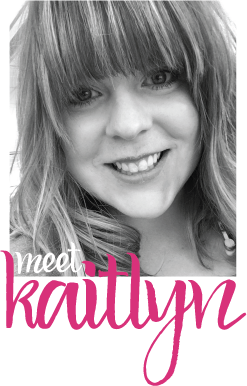 Now click the "Next" button below to hop over to Kate's blog to see what she has created for you! love it! When I saw the banner kit, the first thing I thought of was making an album. Unfortunately I haven't done it yet. Love yours, simply but elegant! Very nice idea, beautiful Kaitlyn! I am beyond in LOVE with this! SO SO SO SO SO SO SO Clever. 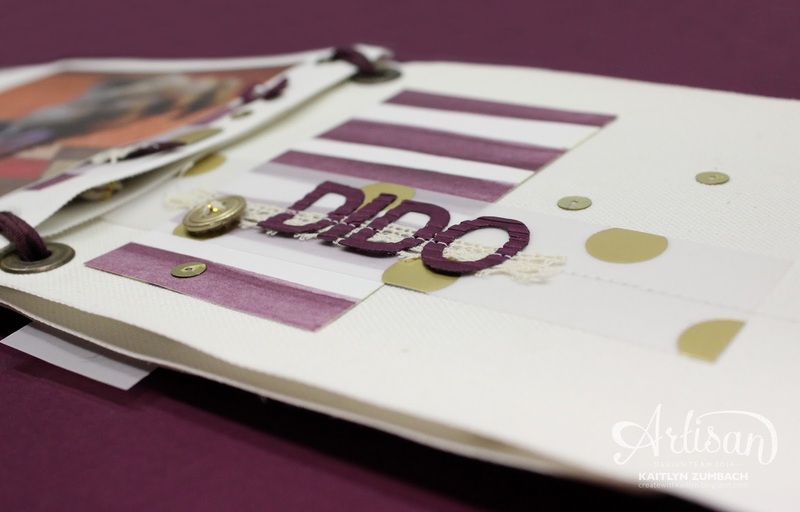 Ooooh wow I love how you've made a minialbum from the Banner Kit...gorgeous!!! Such a creative use of the banner! I love it. 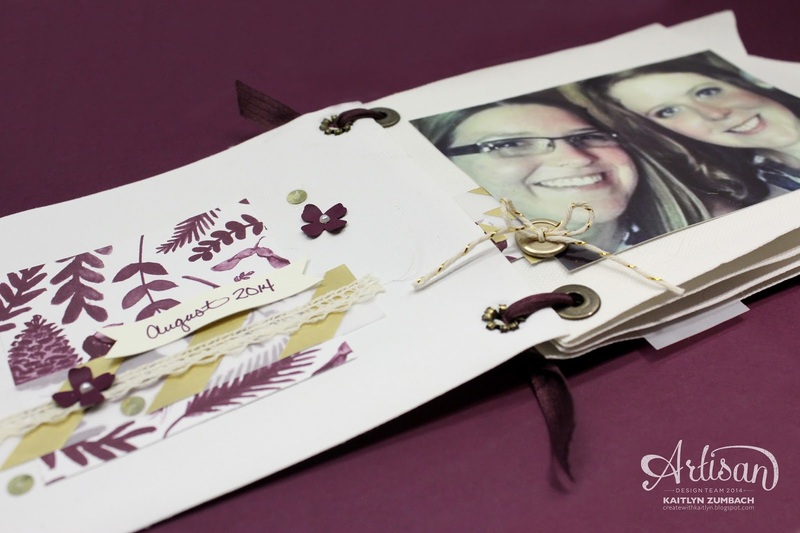 Lovely album and great color choices too!